Brunch parties are often overlooked and under appreciated. Why do dinner parties get all the glory and praise? Brunch menus are so much easier to cook and most people love breakfast foods. It’s so awesome to relax during the early part of the day with your guests, enjoying a different type of meal than the usual dinner fare. Part of the reason we don’t have brunches more often is that most people don’t want to wake up at the crack of dawn to start cooking. I’ve got the perfect recipe that you can prep the night before and then just pop it in the oven in the morning. French Toast is a favorite with many people, and making it into a casserole makes it so much easier to serve for a party or for those days when you want as little work as possible in the morning. 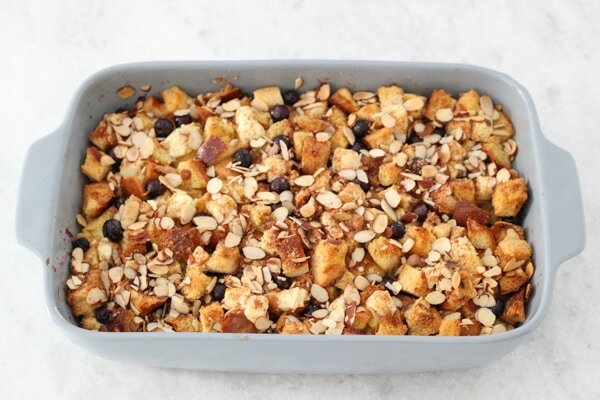 When I shared my recipe for Panettone Bread Pudding this Christmas, I knew that I would have to also share this version of bread pudding, which is my all time favorite. Part of the casserole is creamy and custardy, and has a crunchy, sweet topping. 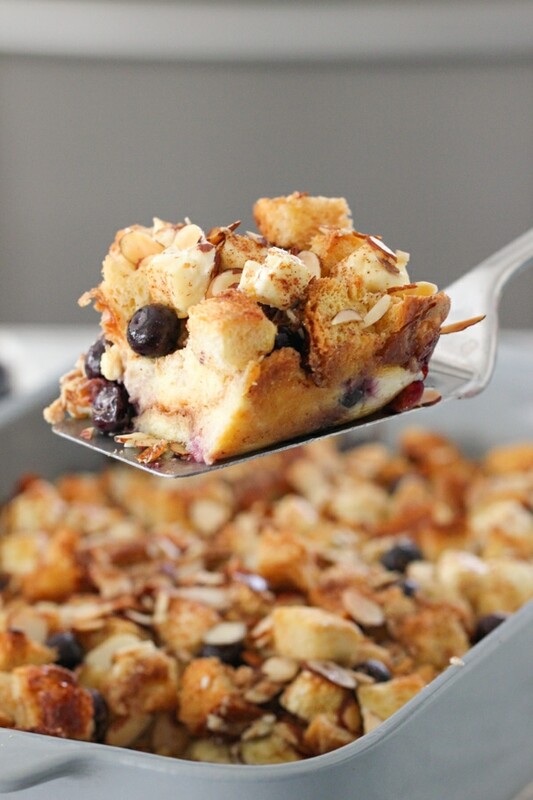 Flavored with cinnamon, vanilla and lemon zest, this casserole also adds in other breakfast stars – blueberries and cream cheese. Who’s excited about hosting a brunch? Or serve this to your family, while getting your beauty sleep on the weekend, and still soaking in all their compliments for treating them to such a feast. Preheat the oven to 325 degrees Fahrenheit. 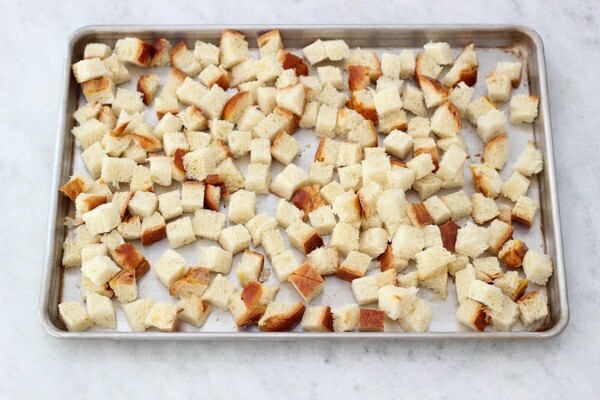 Cut the bread into ¾ – 1 inch cubes. Divide the bread between two rimmed baking sheets. Dry the bread cubes in the preheated oven for about 15 minutes, rotating the baking sheets halfway through and tossing the cubes. Take out of the oven and set aside. It’s important to use dry bread for bread pudding, so that it soaks up the custard well. While the bread cubes are in the oven, brush a 13 x 9 inch rimmed baking dish with 1 Tablespoon of melted butter. 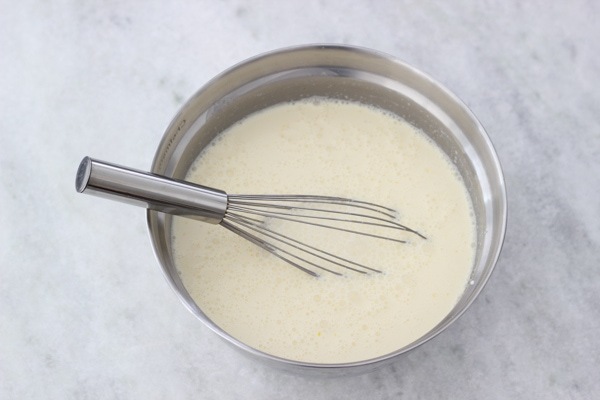 In a large bowl, whisk the half n half, egg yolks, sugar and vanilla extract until evenly combined. You can also use almond extract, which will complement the slivered almonds really nicely. I used 1/2 cup of sugar, but I don’t like things to be sweet, plus, I prefer to have this French Toast Casserole with maple syrup. You might want to add more sugar, 3/4 or even 1 cup total. 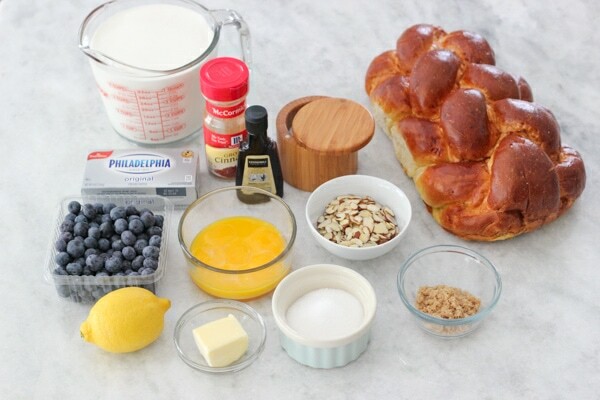 Keep in mind that the cream cheese, the bread and the blueberries are not sweetened at all. It’s easiest to cut the cream cheese when it’s very cold, so keep it refrigerated until you’re ready to cut it. 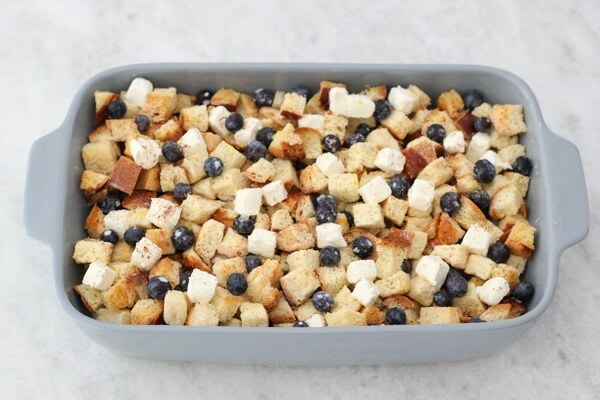 Place half of the bread cubes in the prepared baking dish. Top with half of the cream cheese and half of the blueberries. You can add the cinnamon and the lemon zest right to the custard or sprinkle it on top of the bread. 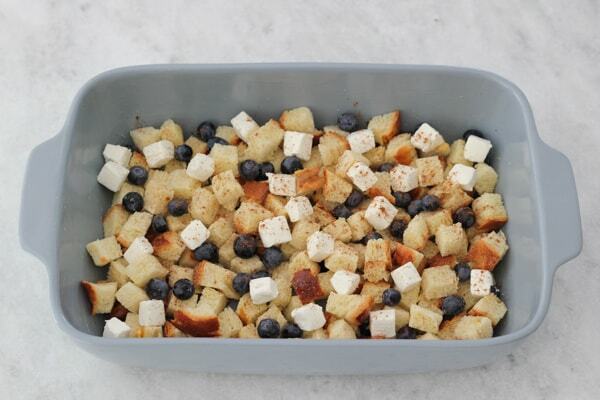 Repeat with the second half of the bread cubes, then the cream cheese and blueberries. Pour the egg mixture over the bread cubes. Brush the top of the bread cubes with the remaining 2 Tablespoons of melted butter. 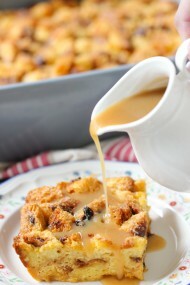 You can bake the bread pudding after letting it soak for about 30 minutes, or cover it up and refrigerate it overnight. Preheat the oven to 350 degrees Fahrenheit. If you stored the bread pudding in the refrigerator, bring it to room temperature for about 30 minutes before placing it into a hot oven. 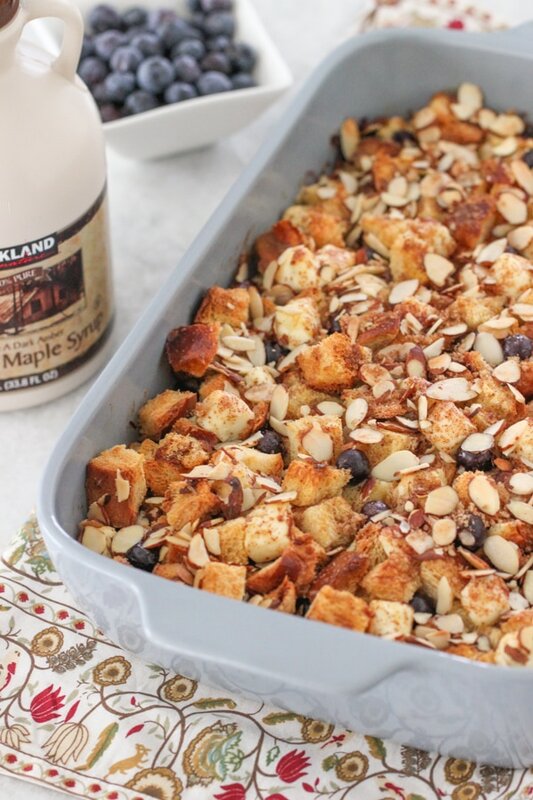 Combine the topping ingredients – cinnamon, almonds and brown sugar in a small bowl and sprinkle it on top of the bread pudding. Bake in the preheated oven for about 45-55 minutes. The center of the bread pudding should be 170-180 degrees. Let the bread pudding stand for about 10-15 minutes before serving. Serve with Maple Syrup or honey. Cut the bread into ¾ - 1 inch cubes. Divide the bread between two rimmed baking sheets. Dry the bread cubes in the preheated oven for about 15 minutes, rotating the baking sheets halfway through and tossing the cubes. Take out of the oven and set aside. It's important to use dry bread for bread pudding, so that it soaks up the custard well. In a large bowl, whisk the half n half, egg yolks, sugar and vanilla extract until evenly combined. You can also use almond extract, which will complement the slivered almonds really nicely. I used ½ cup of sugar, but I don’t like things to be sweet, plus, I prefer to have this French Toast Casserole with maple syrup. 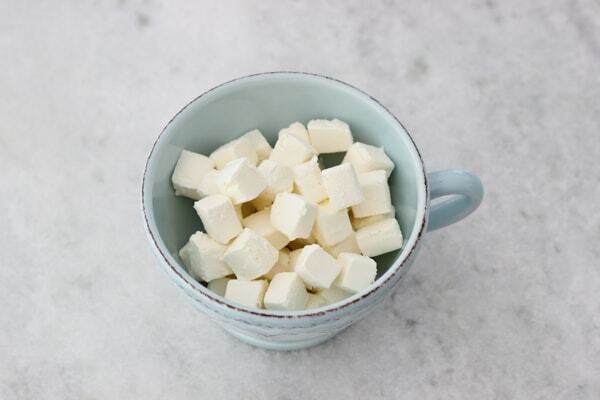 You might want to add more sugar, ¾ or even 1 cup total. Keep in mind that the cream cheese, the bread and the blueberries are not sweetened at all. It’s easiest to cut the cream cheese when it’s very cold, so keep it refrigerated until you’re ready to cut it. Place half of the bread cubes in the prepared baking dish. Top with half of the cream cheese and half of the blueberries. You can add the cinnamon and the lemon zest right to the custard or sprinkle it on top of the bread. 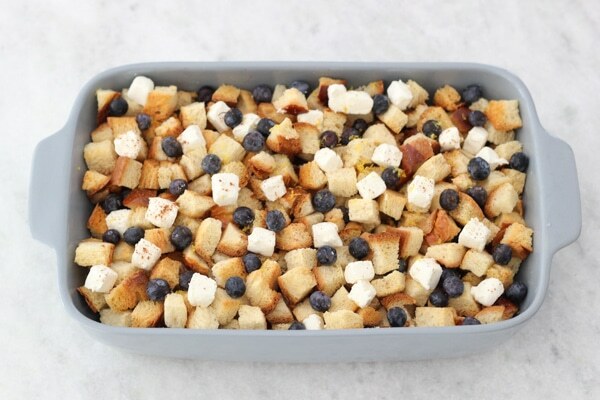 Repeat with the second half of the bread cubes, then the cream cheese and blueberries. Brush the top of the bread cubes with the remaining 2 Tablespoons of melted butter. You can bake the bread pudding after letting it soak for about 30 minutes, or cover it up and refrigerate it overnight. 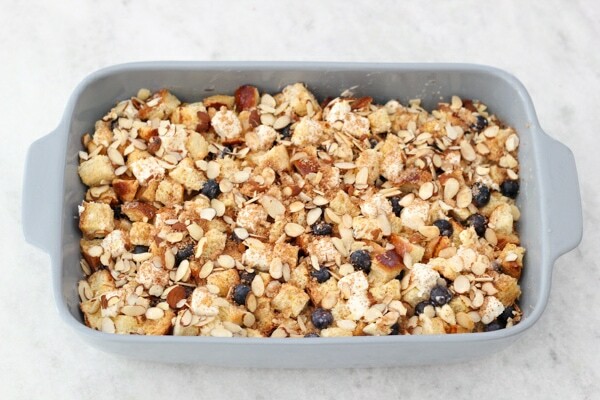 Combine the topping ingredients - cinnamon, almonds and brown sugar in a small bowl and sprinkle it on top of the bread pudding. Bake in the preheated oven for about 45-55 minutes. The center of the bread pudding should be 170-180 degrees. Let the bread pudding stand for about 10-15 minutes before serving. This looks incredible! I love french toast but when you add cream cheese and blueberries it’a just super! Yes! Blueberries and cream cheese make it extra special. I’d love to hear what you think of it once you try it, Anna. Challah is an egg based bread. It is sold in grocery stores in our area. If you can’t find it, you can use Italian or French bread instead. This looks and sounds incredible! I’ve been craving French toast this pregnancy and this is like a cherry on top! Can’t wait to try it! Perfect timing then:). I hope it will be just what you’ve been craving, Inna. How would you the store leftovers? In the fridge or at room temp covered? Store the leftovers in the refrigerator, Inna. I can completely understand, Mila. There are different seasons in life. Maybe when your children are a little older? Besides, you can definitely serve this as a dessert for dinner. Beautiful casserole dish and serving spoon. Where are they from? Thank you, Olga. The casserole dish I bought at Home Goods and the serving spoon is actually a spatula that I’ve had for years and have no idea where I got it. That’s great, Masha. I hope you enjoyed it. The best results are when it’s served right after baking, but it does reheat ok too. It’s pretty much the same as leftover French Toast. This looks amazing! 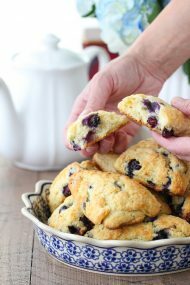 Can i use ftozen blueberries for this recipe? Yes, frozen blueberries would work here too, Vera. They are very convenient to have on hand in the freezer. It’s my go-to berry for desserts. My girlfriends came over for breakfast this morning and I made this casserole and cheesy egg puffs and both of the recipes were a success! I made this for the first time for a family cabin trip. It was AMAZING!! I adored the flavors. Thanks for a great recipe! I’m so glad you enjoyed it, Alena. I can do it with some full eggs instead of all egg yolks right? Don’t know what to do with all those egg whites. Egg whites will give the casserole an “eggy” flavor. If you use only egg yolks, the casserole/bread pudding has a really custardy and smooth flavor. It’s up to you. I prefer to use only egg yolks. You can make meringue frosting, baked meringue cookie, angel food cake, macarons, etc. with the egg whites. The way I look at, if I don’t end up using the egg whites in anything else, I will only be wasting approximately $0.60:). The texture of bread pudding is like french toast that is very custardy. I hope you enjoy it. I think raspberries will work great here. They will get a bit soggy, but as long as you serve the french toast the same day, it should be just fine. Anytime you bake with raspberries they get softer, just like most other berries, so I think that’s just fine:). I’m pretty sure it would taste just as great with other fruit or berries, Tzivia. That’s awesome, Lidiya! I’m thrilled to get such great feedback. 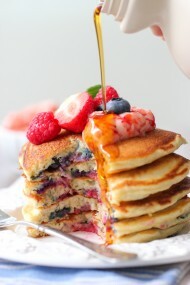 A ladies brunch is definitely a perfect place to serve it:).